Cleaning naturally does not have to be expensive, complicated or time consuming. You can clean nearly every surface in your home with just a few products, most of which you probably already have in your pantry. Vinegar is a natural anti-bacterial agent that I love. I use vinegar in most of my cleaning. I know some people aren’t sure about the smell, but as soon as the vinegar has dried the smell will be gone, and after a while you get used to a vinegar smell. General Spray Cleaner: Mix a solution of 50/50 water & vinegar and place in a spray bottle. Add an optional 20 drops of essential oil (citrus oils like lemon, grapefruit or orange not only smell great, but also help cut the grease.) Use this to clean up kitchen counters, bathroom counters, bath/shower walls, floor spills, etc. I also use this spray on cutting boards to help sanitize them. This is your GO-TO spray bottle. Kitchen Sink: Use general spray cleaner, but for tough deposits apply full strength vinegar and let sit for a minute or two. Wipe clean with a dry towel to bring out the shine. Coffee Pots: Fill a pot with a 50/50 mixture of water and vinegar. Run through the coffee maker the same as you would if you were making a pot of coffee. Dishwasher & Washing Machine: To help disinfect, run an empty load with ½ C of vinegar. I regularly use about 1/3 C vinegar, tossed in the bottom of my dishwasher with each load in place of using Jet Dry. It helps keep away water spots and helps deter hard water buildup. I also use 1/3 C and ¼ C borax, tossed in my front loader if I have items that have a strong odors or stains. Clean Your Microwave: Get all the cooked on stuff off by “cooking “ vinegar in the microwave. Deodorize Carpets: Sprinkle baking soda lightly on carpets. Let sit for 30 minutes and vacuum as usual. Pet Stains/Accidents: Use straight vinegar poured/sprayed on the stain or accident area. Vinegar neutralizes the ammonia in pet urine. If the item can be washed in the washing machine, I will use ½-1 C of vinegar plus a ½ C borax in the washing machine to wash out the urine. Hardwood Floors: This requires you to use olive oil, which most of us have in our pantry anyways and mixing it with vinegar. Read about my attempt at sprucing up my hardwood floors. Cleaning Windows: Use a mixture of 50/50 water and vinegar in a spray bottle. You do not want to use your general use spray if you put an essential oil in it on windows. Spray the window and use a crumpled newspaper to wipe it dry in a circular motion & leave it streak-free. Toilet Bowl: Place ¼ C borax in your toilet before you go to bed and let sit overnight and scrub with toilet brush in the morning. Or you can try cleaning it with vinegar & baking soda. Deodorize Containers: Sprinkle baking soda on the bottom of containers that are filled with strong smells, such as the bottom of a litter box or diaper pail. A small bowl of baking soda in the fridge or freezer also helps absorb odors that occur in them. You could use it in the bottom of a trash can, but I like to spray mine down with the general use spray before I put in a new bag. 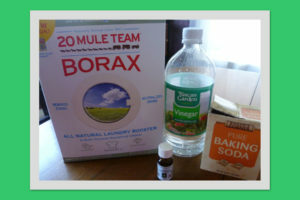 For more ideas on cleaning with vinegar, please check out Cleaningwithvinegar.com, and for more ideas on cleaning with baking soda please check out The New Homemaker and for more ideas on cleaning with borax, read the box it comes in as it is filled with many more ideas or check out the website for 20 Mule Team Borax. You can find borax in the laundry section at your grocery store. What ideas can you share about how you clean naturally? Be sure to check out Save Green Being Green during Earth Week to see what new kinds of natural cleaning projects I tackle, recycled crafts, new plantings and other activities. I use vinegar in place of fabric softener. I fill my fabric softener dispenser about half full with vinegar, then top it off with water. Works great! Love the vinegar in the microwave trick! I just tried it and my microwave is sparkly clean without any caustic chemical smells. Love, love, love this post!! I can’t wait to try some of the ideas. I do use vinegar and other simple products to clean with and I find they work great for a lot less $ and chemicals. Wish there was a way to email posts to myself! !